Cyclic guanosine-3',5'-monophosphate is a compound related to cAMP found in brain, predominantly in the cerebellum. Elucidation of the role of cGMP was delayed because initial expectations that its regulation would be similar to that exisiting for cAMP were not fulfilled. The enzyme guanylate cyclase which forms cGMP from guanosine triphosphate was found to exist in both soluble and membrane-bound forms, and no ligands that stimulated this enzyme were apparent. The first situation in which a function for cGMP was detected was in the mediation of visual signals in rod cells in the retina. 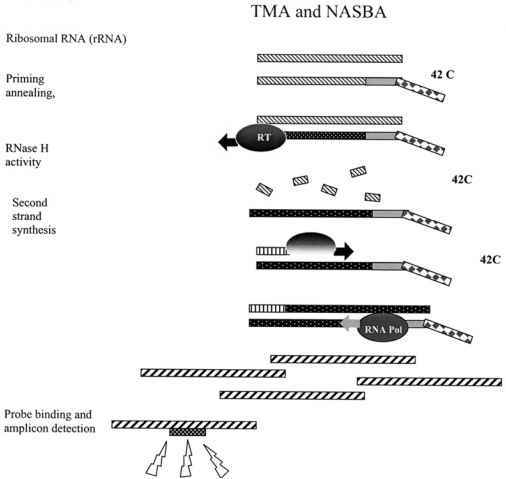 The action of cGMP here differs from the conventional function of second messengers in that a decrease in its level rather than an increase stimulates the signal transduction process. In the absence of light, cGMP holds open the sodium channels in the cell membrane of the rod outer segment, allowing entry of calcium and magnesium ions to the cell. Light photons induce isomerization of the light-sensitive molecule 11-cis-retinal, attached to the seven-transmembrane protein rhodopsin, to all- trans-retinal. This process activates rhodopsin so that it interacts with the G protein transducin (Gat1), inducing its dissociation to Ga- and bg-units. The Ga-unit stimulates the effector enzyme cGMP phosphodiesterase to break down cGMP, resulting in closure of the membrane sodium channels. The soluble form of guanylate cyclase transduces the messages carried by the gaseous signalling molecules nitric oxide and carbon monoxide. These are lipid-soluble extracellular messengers which diffuse into their target cells and activate guanylate cyclase by binding to its haem moiety. (13> Nitric oxide is synthesized from arginine via the enzyme nitric oxide synthase, which is constitutively expressed in neurones and is activated by calcium and calmodulin. This enzyme can be regulated by phosphorylation by protein kinases, an increase in phosphorylation resulting in a decrease in enzyme activity. The main source of calcium ions for activation of nitric oxide synthase is the N-methyl-D-aspartate glutamate receptor, an ionotropic receptor present in high concentrations on the granule cells of the cerebellum. Nitric oxide thus acts as a second messenger with respect to glutamate, but as a first messenger with respect to cGMP (Fig 7). Fig. 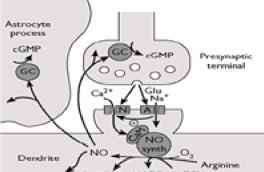 7 Model for the operation of the nitric oxide (NO) system in the central nervous system. Glutamate (Glu) released from presynaptic terminals acts on N-methyl-D-aspartate (NMDA, N) and a-amino-3-hydroxy-5-methylisoxazole-4-propionic acid (AMPA, a) receptors. When the postsynaptic membrane is sufficiently depolarized, calcium ions enter and via calmodulin (CaM) activate the NO synthase. The NO formed diffuses out to neighbouring astrocyte fibres and/or to the presynaptic terminals where it activates guanylate cyclase (GC). (Reproduced with permission from J. Garthwaite (1991). Glutamate, nitric oxide and cell-cell signalling in the nervous system. Trends in Neuroscience, 14, 60-67.) Printed with permission from Elsevier Science.